Posted on January 4, 2016 by Josh Wise. Like many at this time of year, I find myself thinking about new year’s resolutions. I thought about setting some of my standard goals for the new year: getting up earlier, doing more yoga, or writing every day. While all of these goals are worthwhile, none of them capture the intention I want to set for this year. My 2016 goal is simple: Show more love. At this time of year I hear so many people saying the same thing: “I can’t believe it’s already 2016!” I’m one of those people. I really can’t believe it. Where does the time go? I don’t know where it goes, but I know that it goes—and it goes quickly. So my goal is to spend time doing the only thing that seems worthwhile when I think about it. Show more love. I can do this in many ways. I can be kind to myself, to my children, to Lindsey, and to people on the street. I can smile and look people in the eye. I can listen. I can do my work in a way that shows love. I can care for animals and for the earth. I can serve someone in need. I can get up early to share more love. I can practice yoga to show love for my body, mind, and spirit. I can write every day to express love. There are infinite ways to show more love. In a sense, this makes my new year’s resolution a little easier. There are endless opportunities to do it. The key is to be open to the right way to show love in each moment. Yes, there will be moments that I fall short. I’ll be impatient or I’ll make a snap judgment of someone. Those moments offer opportunities to look at where my growth edge lies and resolve to love more the next time. As you show more love, you make shifts in your life and in the lives of those around you. As you expand your ability to love, you widen your circle of compassion. This is evolution. It is how we break down borders and barriers, building bridges and dissolving conflict. Showing more love—to ourselves, to our community, to the entire planet—is how we evolve as individuals. It’s how we evolve collectively. Solving the problems we face today, requires that we expand our ability to connect, to understand, and to take perspectives. This is nothing short of our collective evolution. 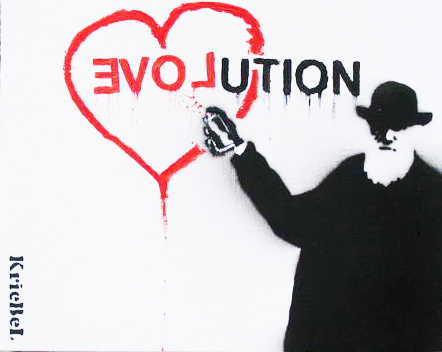 Our collective evolution begins with you and me. It begins with love. This is what I believe and I’m resolving to live it more fully. I’ll show more love. I’ll do it in small ways, trusting that the ripples are far-reaching. We can make a difference. May we show our love through our actions. I wish you a loving 2016.